The 2012 Summer Paralympic Games began in London yesterday and will continue through Sept. 9. Russian Paralympians will compete for medals in 12 sports at these Games. 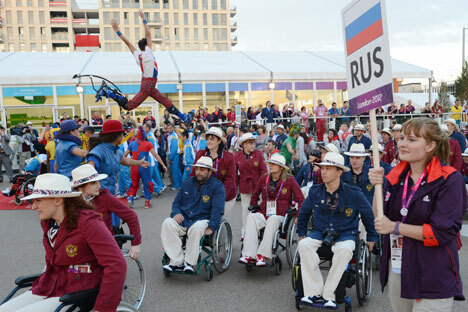 The team of Russian Paralympians competing in these London Games is comprised of representatives from numerous clubs and societies, including the Russian Sports Society (RSFO) Lokomotiv. Coming into the 2012 Summer Paralympic Games, the Lokomotiv Paralympic delegation has a perfect role model in their own club: perhaps the most successful Lokomotiv athlete at the 30th Summer Olympic Games in London was Alexander Butko, the setter for the Russian men’s volleyball team. The Novosibirsk Lokomotiv leader returned home with the team gold that Russia snatched away from Brazil in the dramatic final match of the tournament. Rossiyskaya Gazeta correspondent speaks to RSFO Lokomotiv Executive Director Ilya Vdovin. Rossiyskaya Gazeta: Ilya Andreyevich, would you please comment on the Lokomotiv athletes’ performance in London? Ilya Vdovin: My impressions from the Olympic Games are many-sided. On the one hand, I would have liked a few more medals; on the other, there were athletes whose results made us truly happy. Trap shooter Marina Belikova was very close to the silver in her Olympic debut but stopped short, just one step away from the podium. She lost the bronze after a shoot-off. I was impressed by her performance, though. I believe Belikova has a great potential. Boxer Andrey Zamkovoy, who represented the Far Eastern Railway, won the bronze in men’s welterweight. Alexander Butko, one of the leaders on the men’s national volleyball team, is definitely the biggest Lokomotiv success. The dramatic final game between Russia and Brazil will be remembered for years to come. All-in-all, my experiences from the Olympics are positive. Of course, we will be analysing the results and trying to make it so that even more Lokomotiv athletes can be awarded Olympic medals in the future. RG: Will the club celebrate its London heroes? I.V. : Of course. We will celebrate after RZD company President Vladimir Yakunin returns from his holidays. We will invite all the Lokomotiv Olympians to a reception. I shouldn’t be giving away all the secrets, but I can say that the athletes will definitely receive awards from industry sponsors and so on. RG: Which of the Lokomotiv Paralympians going to London are medal favorites? I.V. : The multi-time, track-and-field European champion Evgeny Kegelev, who will compete in the triple jump for the visually impaired, and the two-time, Paralympic powerlifting champion Tamara Podpalnaya, who is a wheelchair user. She won the gold in Sydney in 2000 and Athens in 2004, and brought home the silver from Beijing four years ago. The 2012 Summer Paralympic Games are the fourteenth Summer Paralympic Games. The Games are expected to be the most commercially successful Paralympics ever. They also mark the return of the Paralympic movement to its birthplace; the British village of Stoke Mandeville first hosted the Stoke Mandeville Games in 1948. London 2012 is the biggest Paralympic Games ever. An estimated total of 4,200 athletes compete in the Games, an increase of 250 athletes in comparison to the 2008 Summer Paralympics. They represent 164 countries, 17 more than in Beijing. RG: Does the Lokomotiv club offer any special sports programs for people with disabilities? I.V. : We are trying to support tournaments for the disabled. For instance, RZD sponsors “Zolotoy Zayats” (Golden Hare) arm-wrestling, bodybuilding and kettlebell-lifting events. We are building an arm-wrestling team of RZD workers who have been injured or disabled in the workplace. RG: September will see the beginning of team sports tournaments. Which of the sports sponsored by Lokomotiv should we keep an eye on? I.V. : First of all, “Lokovolley”, a youth tournament that we organize together with the Western-Siberian Railway and Volleyball Club Lokomotiv (Novosibirsk). We will be holding the tournament for the third year in a row, bringing together teams from all over the country and from other countries as well. We are also looking forward to the RZD President’s Cup in Volleyball, the traditional “Spartakiad” of railway transport veterans, and a new season of the basketball “School League,” for whose prizes youth teams from practically every region of southern Russia compete. This story is available in the original Russian in Rossiyskaya Gazeta.